Look for Anna Kuehl ’81 on the weekends, and chances are she’s taking one of her frequent hikes in the hills of Palos Verdes, about 30 miles south of USC’s University Park Campus. On the trails, she tries to spot the bright petals of her favorite flower, the Santa Catalina mariposa lily. When the skies are clear, she can see all the way to Santa Catalina Island, 22 miles away in the cobalt blue waters of the Pacific. She has come to appreciate the sights, because they’ve grown more precious. The USC Viterbi School of Engineering’s Department of Biomedical Engineering is the first such department established in California. Continuously supported by the National Institutes of Health (NIH) since 1985, the USC Biomedical Simulations Resource produces software used to develop drug therapies for breast cancer and non-Hodgkin’s lymphoma. Transducer Resource Center is a global leader in the development of high frequency ultrasound arrays used for medical diagnostic procedures. It’s funded through a $5 million grant from the NIH. The Health, Technology and Engineering at USC program, known as HTE@ USC, launches as an ambitious four-year certificate program to enable doctors and engineers to work collaboratively to develop advanced medical technology. The USC Institute for Biomedical Therapeutics grows from the National Science Foundation-funded Biomimetic Micro-Electronic Systems Engineering Center at USC. 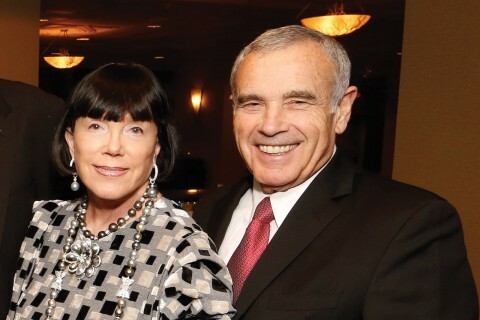 It is jointly supported by USC Viterbi and the Keck School of Medicine of USC, and would later be renamed in honor of the Ginsburgs’ gift. In Kuehl’s mid-30s, doctors diagnosed her with dry age-related macular degeneration. The condition steals sight over time, creating a blind spot in the center of a person’s field of vision. It happens when the macula — part of the retina in the back of the eye — breaks down, but scientists still don’t understand what causes the disease. They do know that millions of people like Kuehl have it, and it has no cure — yet. 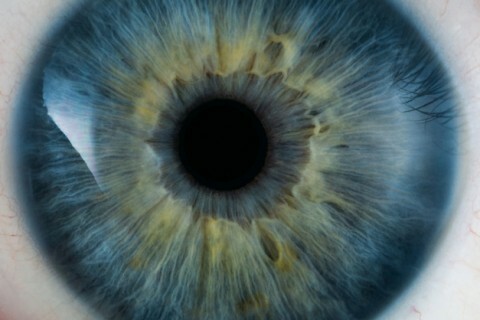 That’s why USC researchers are testing stem cells as a tool to improve and restore eyesight. Now in early clinical trials, the team’s stem cell implant is a complicated proposition. But after years of research, their technique shows promise beyond what they, or Kuehl, could have imagined. Kuehl noticed nothing unusual about her vision, but her ophthalmologist did. She had yellow deposits in her eye, called drusen. They’re an early sign of dry macular degeneration, often occurring years before the onset of visual symptoms. The doctor recommended that Kuehl monitor her vision at home using what’s called an Amsler grid, a tool that ophthalmologists use to detect vision problems. Instead of seeing a single black dot in the center of the grid, patients with macular degeneration see an unfocused, larger black area with no distinct shape — essentially, a large blind spot. Eventually, Kuehl couldn’t see the black dot at all. Though her peripheral vision remained intact, she was losing the central vision in her left eye. She could no longer make out people’s faces clearly, drive a car or read the time on her watch. Even her beloved hiking excursions had become cumbersome. Fortunately, Kuehl’s eye doctor at the time knew of a clinical trial for patients with her condition. The trial, conducted by USC physicians and researchers, was testing an innovative new approach using stem cells. 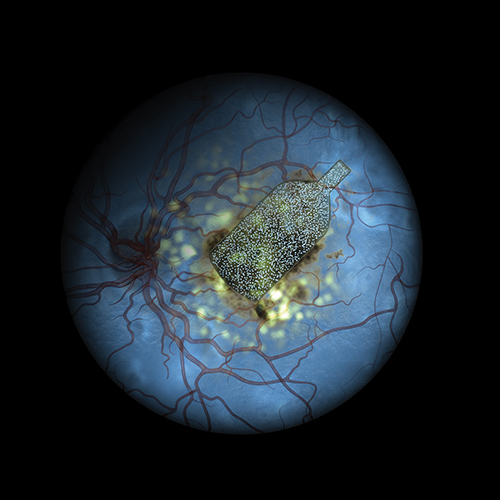 As it turned out, the USC Roski Eye Institute, part of Keck Medicine of USC, had collaborated for more than a decade with other California institutions to develop the first-of-its-kind retinal implant for people with advanced dry age-related macular degeneration. Funded in part by the California Institute for Regenerative Medicine, the study treatment involves implanting a tiny, ultra-thin sheet layered with special cells called retinal pigment epithelium cells into the patient’s eye. Scientists derive these specialized cells from stem cells in the lab. By implanting these sheets of cells, researchers aimed to halt progression of the disease. In the best-case scenario, they believed, the patient’s vision might even improve. The project is led at USC by Mark Humayun, a University Professor of ophthalmology, biomedical engineering and integrative anatomical sciences and director of the USC Dr. Allen and Charlotte Ginsburg Institute for Biomedical Therapeutics, as well as Amir Kashani, assistant professor of clinical ophthalmology, and David Hinton, professor of pathology, all of the Keck School of Medicine of USC. Collaborating engineers and scientists include Dennis Clegg, co-director of the Center for Stem Cell Biology and Engineering at the University of California, Santa Barbara. Kuehl signed up with a newfound hope that the procedure would help restore her vision. Macular degeneration may be inherited or a product of aging, typically showing up in patients 55 or older. Humayun knows how traumatizing it can be to experience vision loss: He watched his own grandmother go blind due to diabetes. After that, his life’s work became a mission to restore sight to the blind. Humayun made news earlier in the decade for the Argus prosthesis, a device he co-invented with USC scientist James Weiland. 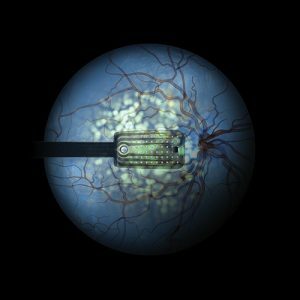 It’s a retinal implant (dubbed a “bionic eye”) that’s designed to give some sense of vision to patients with retinitis pigmentosa, an inherited condition that causes vision loss as the light-sensing cells of the retina deteriorate. In 2013, the FDA approved the second-generation Argus II for use in those with blindness caused by severe to profound cases of retinitis pigmentosa. 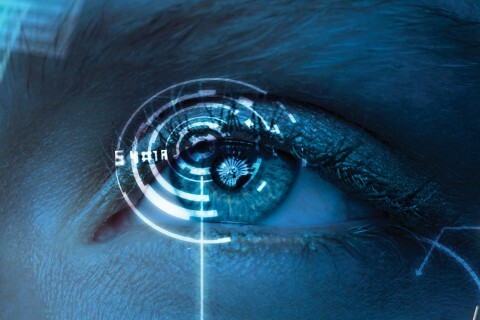 The latest stem cell implant, however, aims at macular degeneration. The vast majority of patients with this disease have the “dry” form, which can’t be treated with medication, so the scientists looked for a different solution—and turned to engineering. Since patients’ retinal pigment epithelium cells are dying, they thought, why not try to replace them? This layer of cells has to be oriented precisely in the eye to heal specific, damaged regions of the macula. It also has tricky logistical challenges: The scaffold carrying the cells needs to seamlessly integrate with a patient’s eye tissue, and it can’t dissolve or erode in the eye. To meet these complicated requirements, Humayun, a biomedical engineer by trade, and a team of Caltech collaborators found a solution with parylene, a biocompatible piece of plastic that can be machined in extremely thin form. “In certain areas, it’s as thick as only two human hairs and needs to be very thin to allow the diffusion exchange of nutrients, but it also has to be strong enough to carry the RPE cells, so we can fold it and get it in through small, surgical incisions,” Humayun says. Anna Kuehl was selected for the clinical trial at Keck Medicine and underwent surgery on her left eye in October 2017. In the operating room, Kashani, the eye surgeon for the trial, carefully maneuvered the parylene carrier, only 4 to 6 microns thick, into the exact spot of the retina where Kuehl’s own cells had atrophied or died. After locating the damaged area, he then carefully inserted the implant without harming surrounding tissue. Kuehl slept with a shield on her eye that night and went back to the doctor’s office the following morning. After the shield was removed, she went through a thorough vision test for about an hour, in both bright and dark conditions. Because it was an early-stage trial, the research team wasn’t prepared for the exceptionally positive results they saw. “We weren’t really expecting anything significant since most of these patients had such severe disease,” Kashani says. In fact, one patient’s vision was notably better when tested with an eye chart, demonstrating an ability to read an impressive 17 more letters than before the implant. For two other patients, tests continue to show that their sight is improving, even if they aren’t able to see well enough to read yet. For the next phase of the clinical trial, researchers will need to conduct a multicenter trial with a larger group of subjects who have less-severe disease. Extrapolating beyond the study, Humayun hopes that one basic idea will have been proven: that stem cells can create replacement parts, organs, tissues and cells. Since the surgery, Kuehl frequently notices small changes in her vision. She can make out the time on her watch again. Reading has become much easier, and she can follow the subtitles on opera broadcasts. She can even see people’s whole faces again.